On The Download: Phish Live! For Phish fans, Hampton Coliseum in Hampton, VA, is known quite simply as "The Mothership." Some of the most legendary concerts the band has played have been here, so with the announcement of the three-night reunion run, it was only natural that the first shows back were at Hampton. Fans gathered from far and wide (and Canada!) to witness the return of Phish, and when Trey, Mike, Fish, and Page took the stage, the level of excitement and anticipation was so high, one couldn't be blamed for thinking the joy generated by the 14,000 people in attendance were going to make "The Mothership" actually lift off. In the days leading up to the show, there was much debate amongst fans what the first song would be. "Tweezer?" "Chalk Dust Torture?" It would have to be big and loud. And it would have to get the crowd dancing. So when the lights went down at 8 PM and the band took the stage, the massive "Fluffhead" that opened the show did not disappoint. Not only had they not played "Fluffhead" since the band first went on their first hiatus in 2000, the level of intricacy and timing involved in pulling off the 16+ minute epic showed the boys were really, truly back, and were getting straight down to business. Next up was the majestic "The Divided Sky," followed by a raging "Chalk Dust Torture." "I Didn't Know" even featured a patented John Fishman solo on his Electrolux vacuum cleaner. Over the course of the nearly two hour first set, Phish kept the free-flow improvisation to a minimum, concentrating on nailing the nuances of some of their shorter songs like "Suzy Greenberg," "Farmhouse," "NICU," and "Horn" before leading into a tight "The Squirming Coil," and finished the set with a huge "David Bowie." 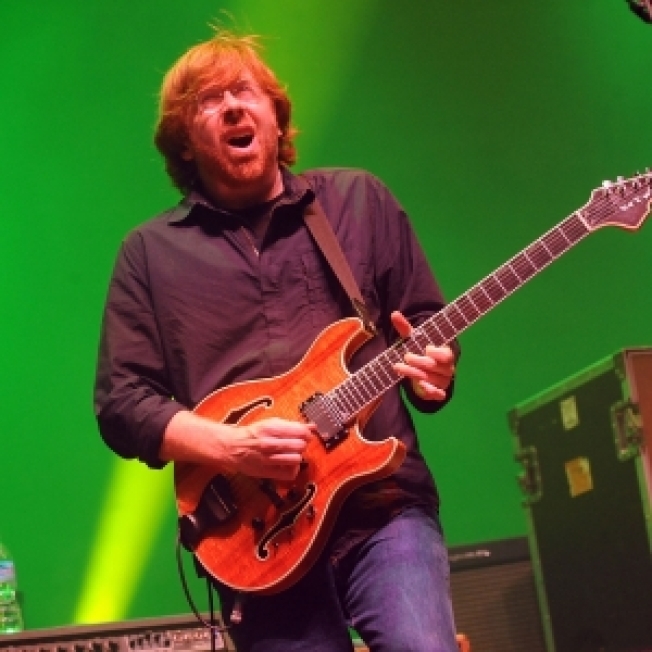 The second set opened with the new song "Backwards Down The Number Line," which Trey Anastasio (lead guitar) had premiered on his solo tour last year with an eye towards using it as a jam vehicle for Phish, and the tune shows a lot of promise for future jams. Next up was the perennial crowd favorite, "Tweezer" (the "Tweezer Reprise" would be the final song of the weekend, two nights later). Mike Gordon took over the reigns for "Possum," and then the boys unleashed "Theme From The Bottom," "First Tube," and a monster "Harry Hood" before slowing things down again for the love song "Waste." "You Enjoy Myself," one of the most intricate tunes in Phish's repertoire, did not go smoothly at first, and required a quick (and very rare) restart, but once it got going, the jamming was in full effect. At one point during the song, trampolines were brought out on stage for Trey and Mike to bounce on as they played. With "YEM" closing out the second set, Phish reemerged for the encore with an a capella "Grind" and then a "Bouncing Around The Room," where giant balloons that had been hanging from the ceiling were released onto the crowd below. The final song of the night, a cover of the Rolling Stones "Loving Cup," got huge cheers, especially when Trey sang, not without irony, that "You know I play a bad guitar." And with that, Phish had returned. Happy, healthy, and ready to go back on the road. And, an entire nation of Phish fans are ready to join them. *Due to the overwhelming demand for tickets, and not wanting to disappoint their fans who couldn't make it to the shows, Phish has graciously released free soundboard copies of the entire three night run on livephish.com for a limited time. If you've ever been curious to hear the band and see what the big deal is all about, these recordings make an excellent jumping on point.